MINUTE TO WIN IT: Contestant Second Chance at Redemption! NBC game show “Minute to Win It” hosted by Guy Fieri returned to filming more episodes today at the Sunset Gower lot in Hollywood, Ca. The first show filming since the holiday break, host, Fieri told a story of his disastrous attempt to deep fry a turkey during Thanksgiving. He dropped a turkey into an overfull pot only to have it boil over and catch on fire. In a panic, he said he hurled it all outside and threw water on it which he said just added to the flames. As he went to pick-up the turkey after “accessing the situation”, his wife caught him in the act. “Minute to Win It” contestants won’t be playing with turkey in any of their stunts, but the show has brought about some more changes. One of which has Fieri standing in the audience to introduce the first contestant of the day. This new batch of shows will unveil some new rules and a special themed episode titled “Second Chances – Redemption” which brought back Mark, a hair stylist from Sherman Oaks, Ca who originally played the game in the first season. Fieri described his episode being so emotional that there wasn’t a dry eye in the room. 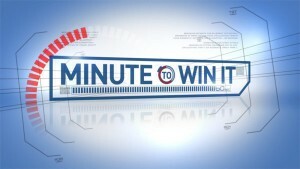 When “Minute to Win It” first began, contestants were not given the opportunity to bank money at various levels in the game the way it is currently played. If contestants did not make it beyond the $50,000 level, they walked with nothing. As Fieri stated, “we saw a lot of people leave the show with no money”. At the opening of today’s first episode, Fieri announced some more changes made in the game play of “Minute to Win It”. These changes have been carried-over from the holiday shows. Players (In the “Second Chances” episode) will be able to bank their money not only at just the $1000 and $50,000 increments, but will also be allowed to keep their winnings should they win their $125,000 and $500,000 rounds as well. Today’s show also gave Mark the added bonuses that were given away on the Christmas shows which were one extra life and ten extra seconds. Game challenges were “Old School” Minute’ reminiscent of the first season: Hanky Panky, Noodling Around, Bottoms Up, Johnny Applestack, Spoon Toon, Sticker Picker Upper, and What a Racquet. After his first appearance on the show, Mark stated that he had fans come-up to him and say “sorry”. One in particular woman who stopped him in a Las Vegas buffet. We can’t say how well Mark fared this time around. However, he did make it past the $50,000 level. Air date to be announced. On stage today, Mark also had a second chance to make it up to his wife and two daughters who were seated in the audience. He stated that although he didn’t feel like a “loser” he certainly learned a lot about himself and his family because of the game. This was his second chance to claim a piece of what was lost in his previous show. While “Minute to Win It” is having “redemption” shows, I have to add that I hope to see some of the strangers who were paired-up on the show about mid first season and didn’t do so well due to their partners. Let’s bring some of them back but this time playing on stage by themselves!